Exzen has invested every effort & time to create a most sophisticated design. 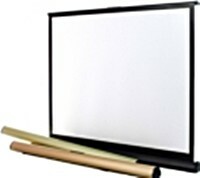 Exzen’s table screen provides various color choices in order to satisfy our customer’s needs. Basically, Exzen’s table screen has 3 color choices which are Apple Green, Champagne Gold and Black. EZ-T42HPV has been improved with an anti-twisted system in order to prevent distortion of the screen. Also, Exzen’s unique masking technology does not allow overlap masking side at the corner of the screen. This remarkable masking technology makes the quality of EZ-T42HPV unbeatable.